What is being done to address the shortage of funds? When the central government revealed to the Supreme Court on 19 April that at least 33 crore Indians are reeling under drought, it added that it is helpless because states are supposed to deal with drought. That's far from true. Not only does the government have a scheme for promoting rural drinking water, it has also been starving it of funds ever since coming to office. 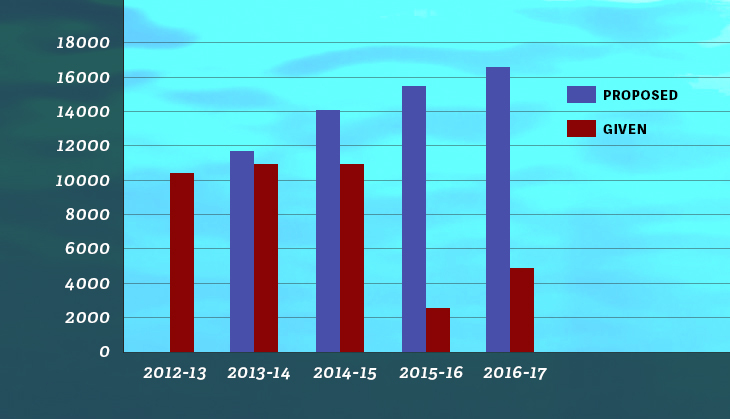 Since 2015, the National Rural Drinking Water Programme (NRDWP) has survived on just a fraction of the money it used to get. The fall began, in fact, in 2014, when the NDA government changed its focus from drinking water to sanitation i.e. Swachh Bharat Abhiyan. As a result, its work has taken a big hit. A Parliamentary Standing Committee report released on 6 May reveals that the government will be unable to achieve its 2017 target of providing 50% rural households with piped water. It quotes the Ministry of Drinking Water and Sanitation (in charge of both NRDWP and Swachh Bharat) saying that its requests for funds for NRDWP have been repeatedly denied by the finance ministry, NITI Aayog and the Prime Minister's Office. Struggling with very little money, the ministry is now exploring options such as borrowing money from World Bank to complete projects. In contrast, funding for Swachh Bharat Abhiyan (rural) - Prime Minister Modi's flagship sanitation programme - has actually increased, with even a Swachh Bharat Cess implemented on services to pay for it. The government's attitude is best described by a recent anecdote. 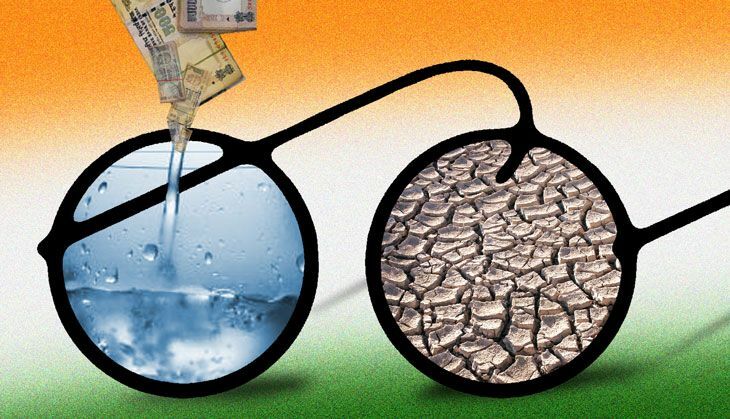 On 25 April, six days after the government revealed that over 33 crore Indians were affected by drought, the Ministry of Drinking Water and Sanitation issued a statement that it had "reached out" to Maharashtra. Since three-fourths of the state's districts (and home to 3.7 crore persons) are drought-hit, and hundreds of farmers have committed suicide, this "reaching out" seemed like a welcome sign. But the entire meeting had nothing to do with drinking water. As the statement elaborates, the Ministry's secretary and state chief minister Devendra Fadnavis discussed only sanitation, with the two reviewing implementation of Swachh Bharat Mission in the state, and Fadnavis promising to make 10,000 villages 'open defecation free' by 2017. Did the two feel the irony, or the elephant in the room, of the 15,747 drought-hit villages in the state? The meeting is quite symbolic of the Modi government's priorities. Between 2012 and 2015, the drinking water and sanitation ministry got about Rs 14,000 crore each year, of which the lion's share went to NRDWP. But since 2015 there has been a shift towards funding Swachh Bharat at the cost of NRDWP. The NRDWP provides financial, policy, and technical guidance to states in providing piped water supply to rural houses. (Water is a state subject according to the Constitution, so the central government cannot directly do this.) It has a target of ensuring 50% households are covered by 2017, and 90% by 2022. 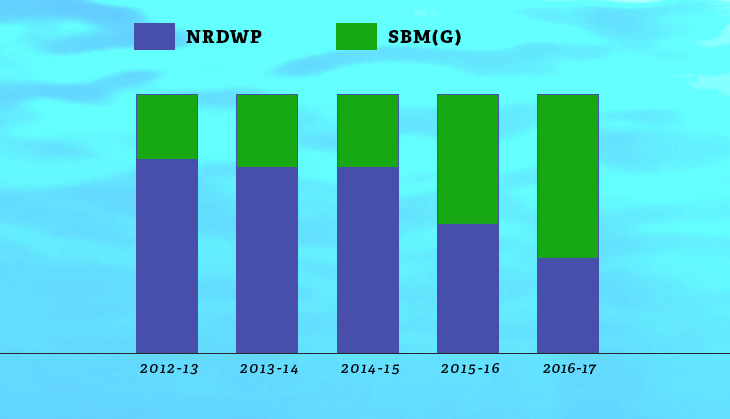 The NRDWP got around Rs 11,000 crore in 2012-13 and 2013-14 (the Ministry was created in 2011). In 2014, when the NDA government came to power, it promised Rs 11,000 crore to the programme, but eventually revised it down to Rs 9,250 crore. The next year, allocations fell sharply fell by a fifth to Rs 2,611 crore, and were revised up to Rs 4,373 crore. In the latest 2016-17 budget, it got Rs 5,000 crore, still less than half of what it got in 2012. In fact, the ministry has been asking for almost thrice the amount that is eventually approved. This indicates how much the ministry thinks is needed to run the programme. In 2016-17, for example, while the ministry had asked for Rs 16,600 crore when it got just Rs 5,000 crore. On 6 May, the Parliamentary Standing Committee on Rural Development released its report on the budget funds given to the MWDS. The report reveals how the ministry is struggling with a funds crunch for drinking water projects, and "asking themselves" how they will achieve their targets will lesser money. Deposing before the Committee, the secretary of the ministry didn't mince words. "Since 2012-2013, we were getting Rs. 10,500 crore at that time; and this year, we have got only Rs. 5,000 crore. So, the question was this. How are we going to achieve coverage with half the money? It is a very basic question, which we are also asking ourselves," the report quotes the Secretary as saying. According to the Parliamentary committee's report in 2015, the ministry had asked the finance ministry for an additional grant of Rs 10,000 crore, but this never came. In 2015, the ministry had also revealed to the committee that it had raised paucity of funds as an issue with the finance ministry, NITI Aayog and Prime Minister's Office, but no extra funds were released. While the government is funding sanitation largely through the Swachh Bharat Cess - charged on all services - it has left the drinking water program to fend for itself. "Of course, we will approach the Finance Ministry and we will request your good offices to try to get us more funds during the year and in Supplementary also, but one practical step is to approach the external financing agencies," the secretary told the committee. "There are five agencies, which can potentially be approached, namely, the World Bank, the Asian Development Bank, the New Development Bank, the Asia Infrastructure Financing Bank, and there are JICA and other bilateral agencies." One reason for the big drop of funds in 2015 has been the 14th Finance Commission - where centre has given a higher share of taxes money to states. So there is a higher expectation for states to pay up for programmes like NRDWP. But as per the Commission report, the centre is supposed to fund 60% of NRDWP, and the states making up the rest. A back of the envelope calculation suggests that Rs 5,000 crore given by the centre means that the total money spent (including by states) cannot exceed Rs 8,333 crore (60% of which equals 5000). This translates to a 25% drop in funds from the pre-2015 levels. Not surprisingly, work has been hit and states are feeling the pinch. On 3 February, the ministry had held a consultation with state ministers and secretaries in charge of rural water supply, along with NITI Aayog officials. "All the States Ministers/Secretaries have requested for increase in the NRDWP Budgets so that physical outcomes of providing safe drinking water to the rural population can be achieved," the ministry told the Parliamentary committee. "The Committee are dismayed to note that most important sector of rural drinking water supply directly affecting nearly half the population of the country has been fund starved," the committee said in its conclusions of the report. It said that with the programme starved of funds, the "herculean task" of providing clean water "seems to be a distant dream". "The Committee feel that there is strong case for more funds to be made available to MoDWS for looking after the current needs of safe drinking water in rural areas of the country," it added. "Ideally both water and sanitation need equal importance in terms of provisioning and policy efforts... Increasing allocations for rural drinking water should be taken up on a priority basis," the Centre for Budget Governance and Accountability said in a report released in January.